My dog broke my nose last week. We were playing a game of Who’s Got the Biscuit? and I reached under him to steal his cookie out of his mouth on the far side. Naturally he pulled away from the thieving hand, but that meant that he swung his hard little puppy skull right into the bridge of my nose. There was a horrible crunching noise. He dropped the cookie and immediately became Nurse Nancy, licking the air in my general direction by way of apology. I immediately iced the painful not-bone protuberance until I could not feel it anymore. I even went to bed wearing an ice cube taped to my nose. The swelling went down and the black stripe across my bridge was undoubtedly lessened by the frozen attentions. Just prior to that fun day, we went for a walk on a beach near Laguna. The sand was covered with what looked like little crawdads. Miles and miles of these guys washed ashore, stranded in the helpless bug position. 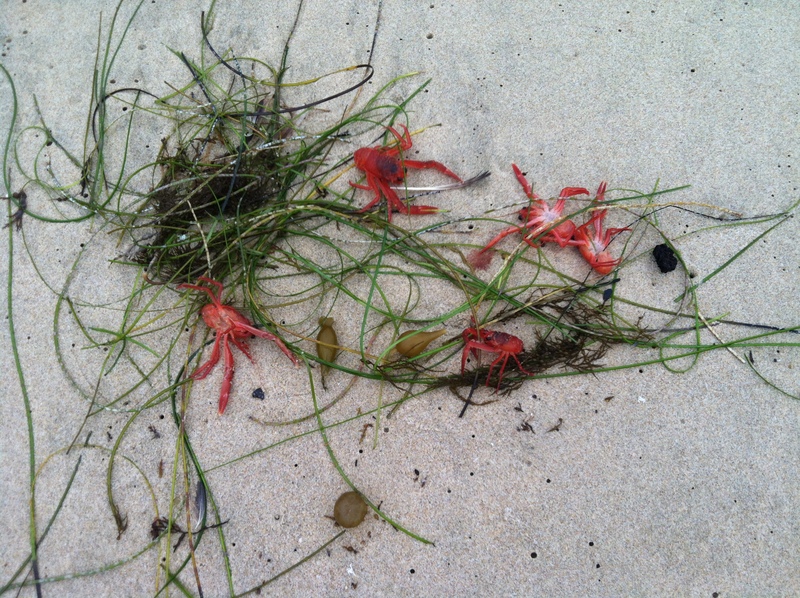 Turned out they were baby crabs, not lobsters or crawdads. 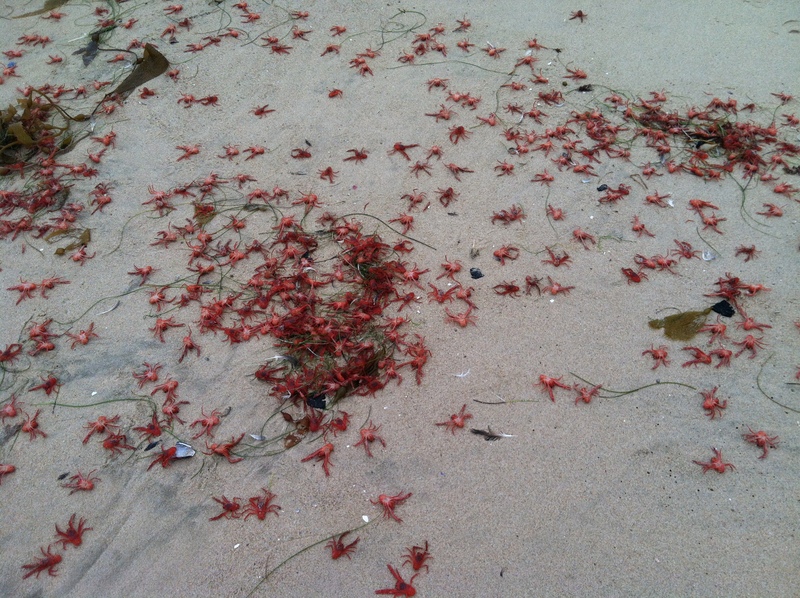 The warm water brought them in and thousands were tossed on the beach by the tide. I wondered how it would be possible to call an alert – everybody in the area who cares about such things come down and scoop them up and take them way out beyond the waves and dump them back in the water. That would be brilliant. But I have no idea how to call up a flash mob to rescue crab babies, and so I just felt sick and helpless as I tried not to step on any of them. There should be an app for acting on spontaneous kindness. Some kind of superhero app. You’d sign up for text alerts. This alert would be ” Need people, boats, pails, and wide flat shovels to transfer stranded crab babies into ocean from Crystal Cove Beach – Date – Time” and then there would be a symbol like the batman logo. You could tap it and give your eta. I wonder how many people would take time and energy to do something like that? Random acts of generosity for those in need. Hmmm. This entry was posted on Saturday, June 6th, 2015 at 12:43 am and is filed under Uncategorized. You can feed this entry. You can leave a response, or trackback from your own site. When we got back from hiking the El Camino. We picked up our Dalmatian at the kennel. Let’s just say he was happy to see us. I bent over, he jumped up, Pow! Also right in the nose. I immediately started shedding blood all over the floor of the kennel office. There were no pleasing crunchy noises, but it was sore for a week or two. Where are the “Rocky” pix? « Pest Bird Abatement book now Available!